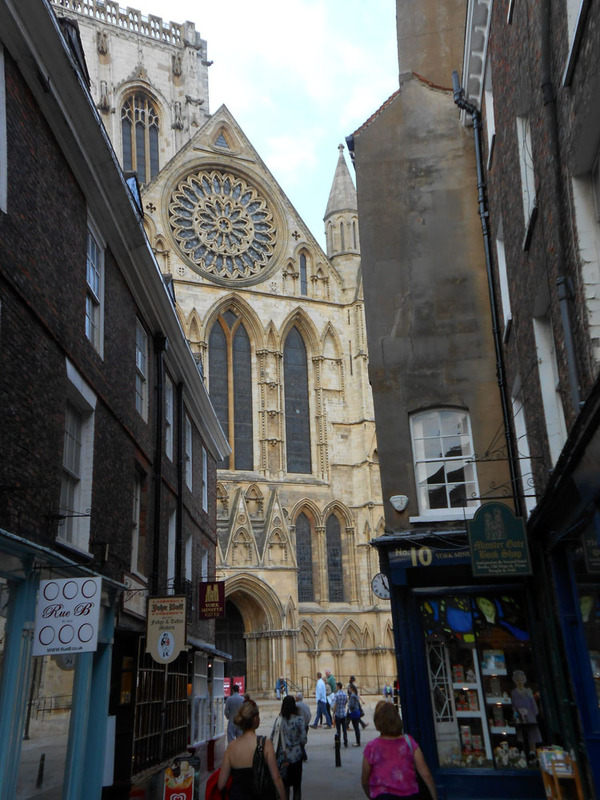 Here is a glimpse of magnificent York Minster, as seen from one of the narrow streets in the oldest medieval part of the town, known generally as The Shambles – because of all the butchers’ mess. This is the interior of a medieval church in the French town of Nevers. 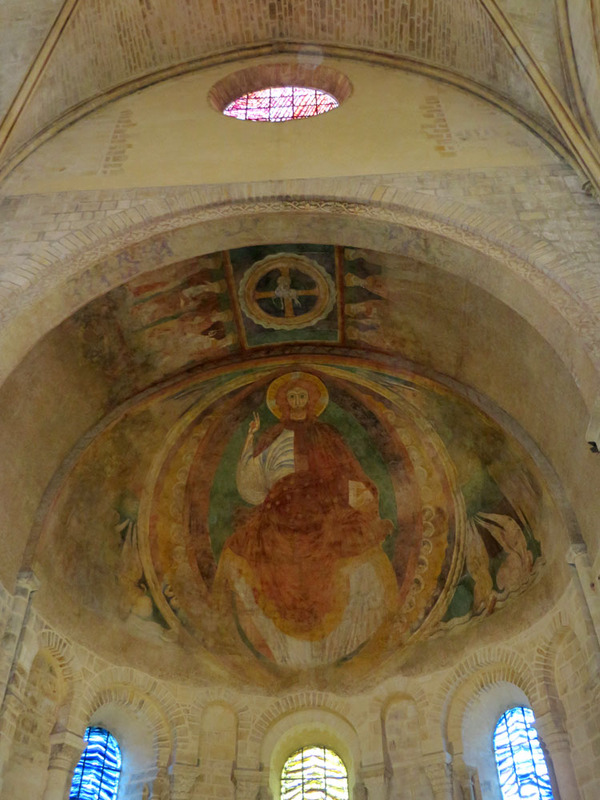 It is sadly dilapidated, neglected, even, but when I saw this astonishing medieval fresco I was spellbound. 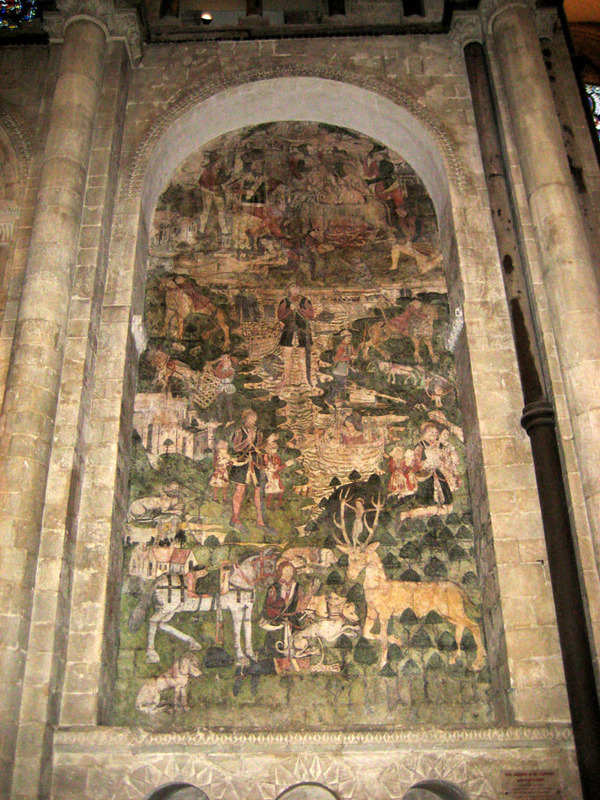 Another medieval fresco, this time in the shatteringly atmospheric Canterbury Cathedral. It was here that Henry II’s former best friend, Thomas Becket, was murdered by four knights who may or may not have done their royal master’s carefully ambiguous bidding. Also in this amazing place is the tomb of Edward III’s beloved son, the Black Prince, who should have been king after him. Instead England got Richard II, his son, and it was his eventual deposition (the first in England’s history) and murder that fatally undermined the inviolable position of king. 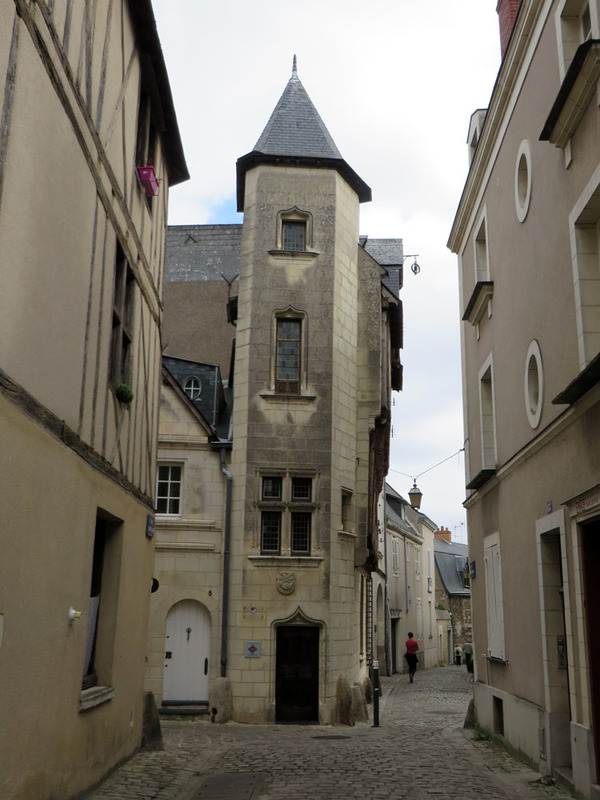 Medieval streets and buildings in the French town of Angers. 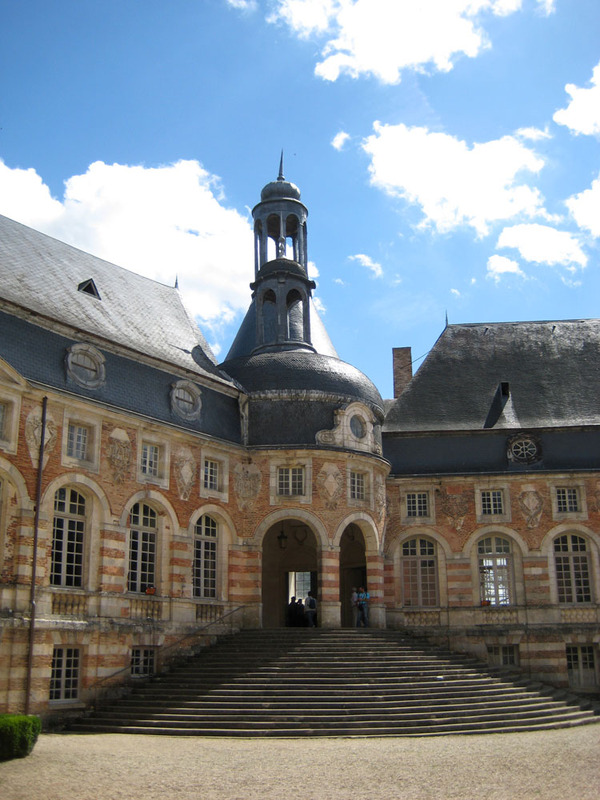 This was the seat of the Angevins. When Henry I’s widowed daughter Matilda married Geoffrey of Anjou and gave birth to a son, who became King Henry II, she planted the seeds of the Plantagenet dynasty in England and was able to bring its first long and bitter civil war to a peaceful conclusion. Now, hold onto your hats. This is part of the private staff residential section of modern-day Windsor Castle. 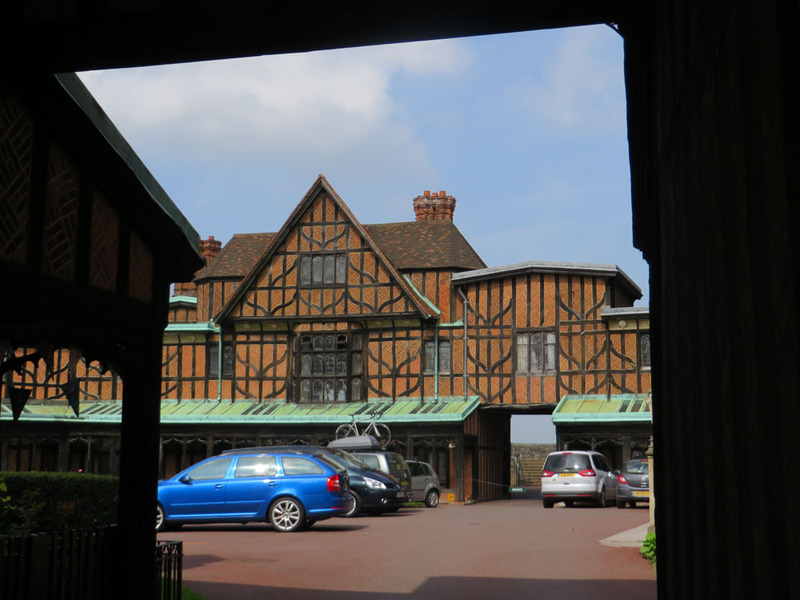 But you see that main room, with the sharply gabled roof and wide window? William Shakespeare wrote one of his plays in there. And to the left, out of shot, is where he had it performed for Elizabeth I. Alas, I don’t know which play because the kind gentleman who let me into the private section for a quick stickybeak didn’t say, and hurried off before I could ask. 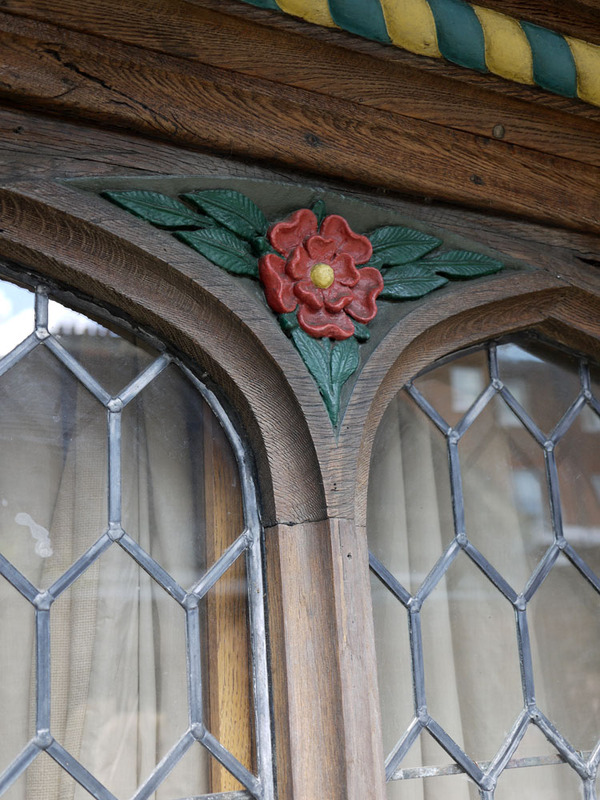 A window feature in one of the Tudor houses behind Canterbury Cathedral, where you’ll find the very exclusive King’s College. 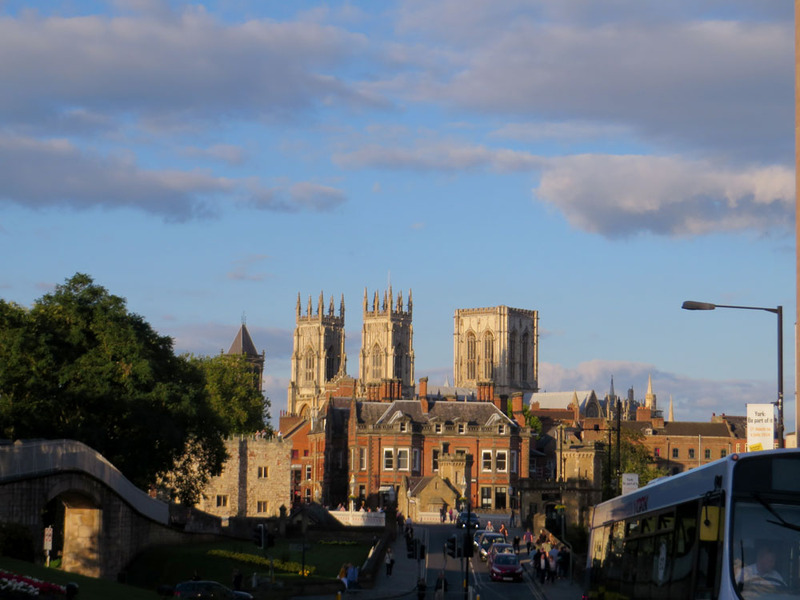 York Minster, rising above the town as you walk into it across the river. I’m not sure how old this house is, but it’s old and it has the most amazing window features. It too is in Canterbury. 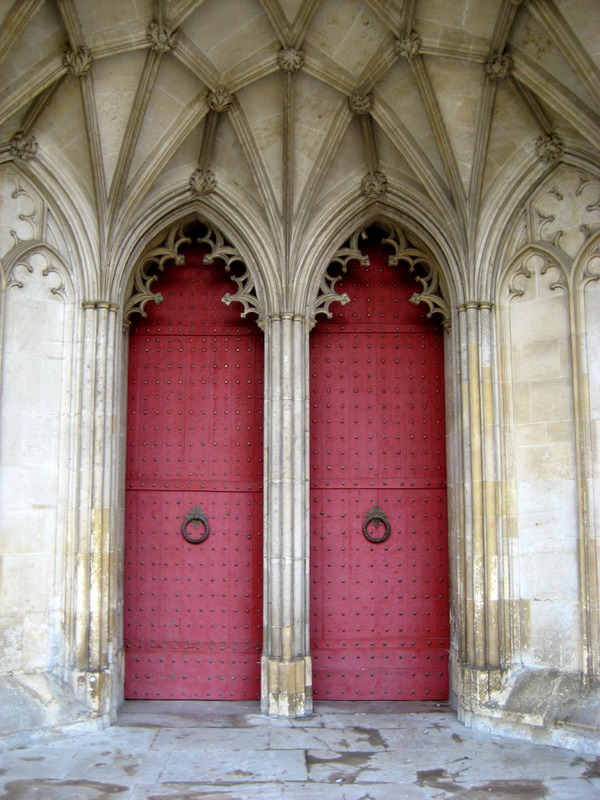 Doors leading into Winchester cathedral. 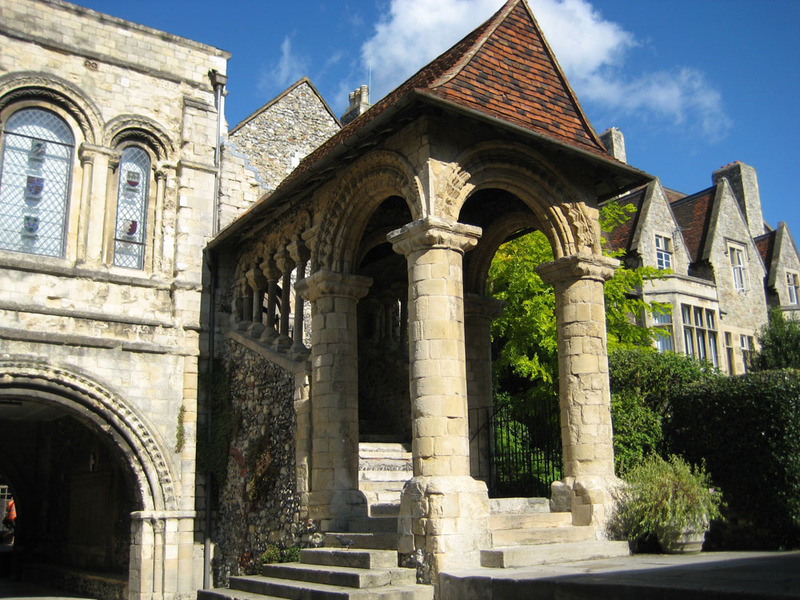 Winchester was the original capital of England. 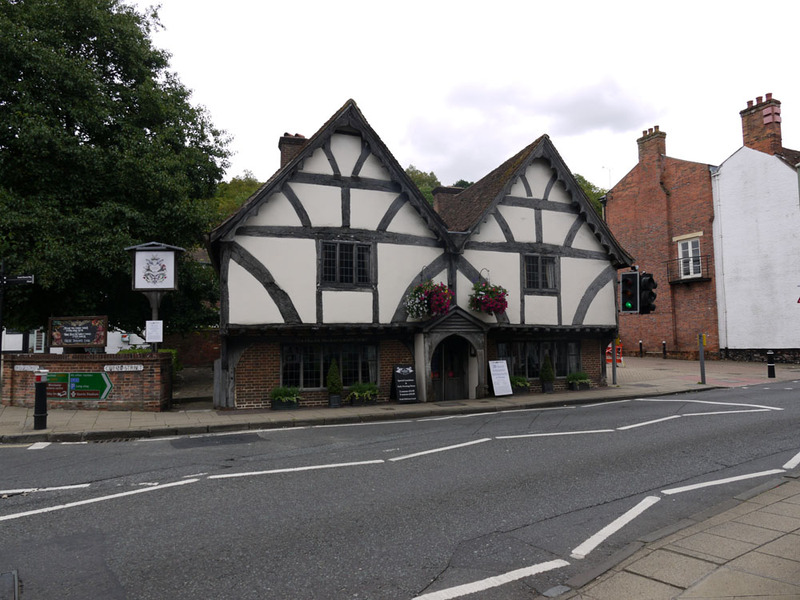 Still in Winchester, here’s an amazing little restaurant where I had a lovely lunch. 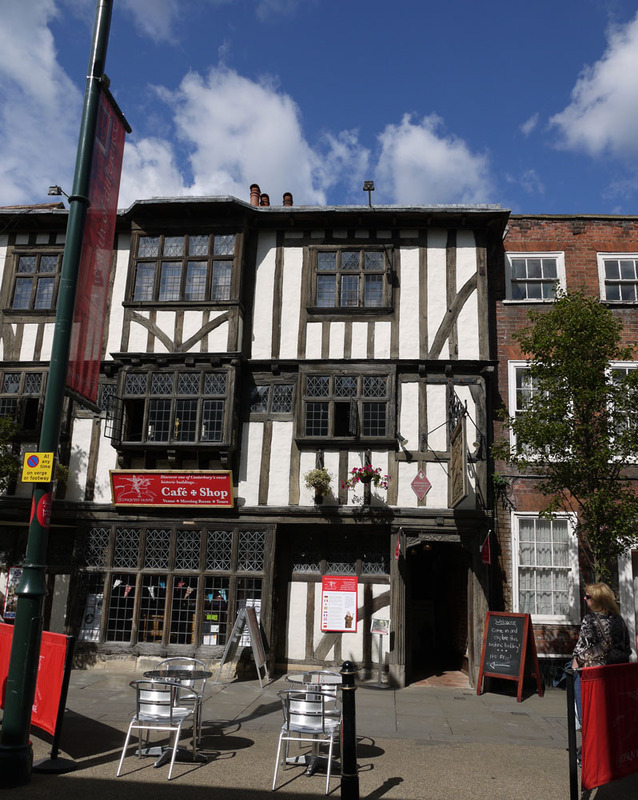 The building dates from the 1400s. My table was at the window on the right, looking at the picture, and the sill was at table level. You stepped down into the restaurant. The upstairs is reached by some seriously challenging, narrow stairs. The floors are all uneven and original oak. Stunning. 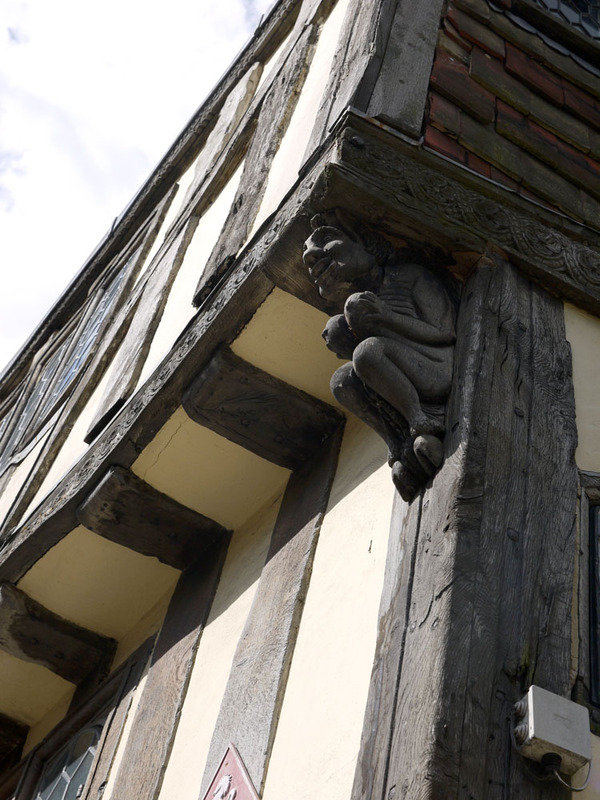 Another amazing window support on a medieval building in Canterbury. 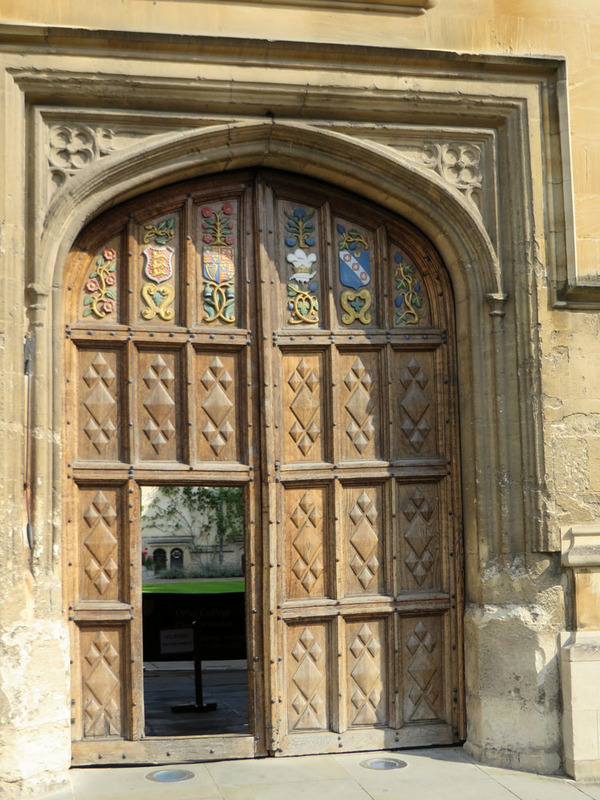 Two doors in Oxford. The first is the entrance into one of the colleges. Note the coats of arms. 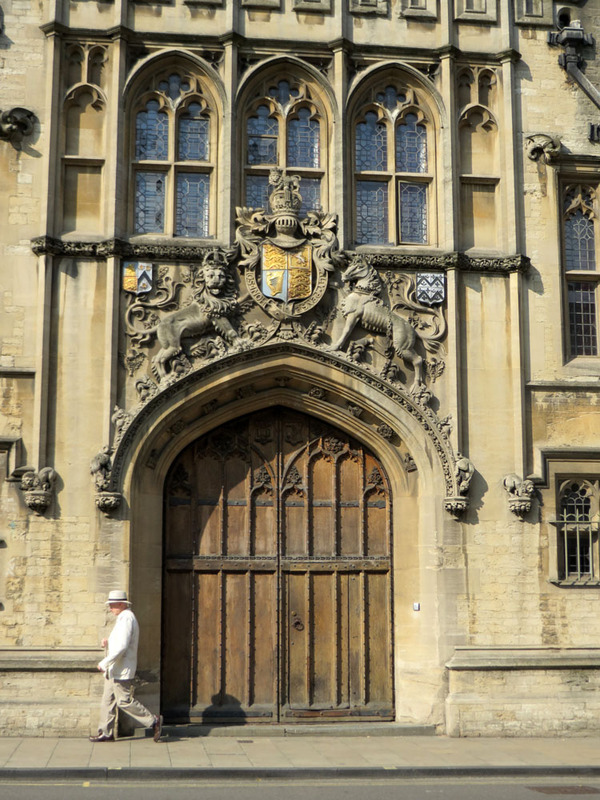 And this one is the entrance into a building I couldn’t identify – but obviously, given the royal standard and the heraldry, something important! 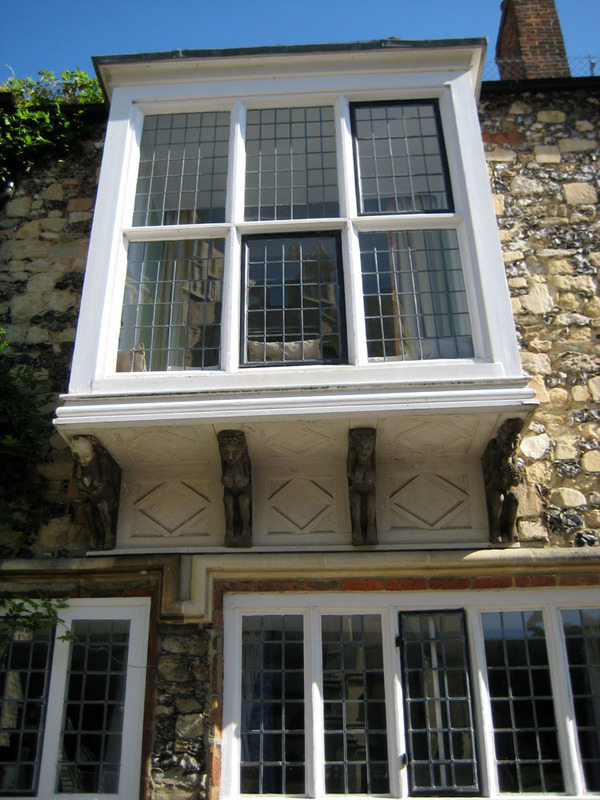 This staircase, to be found at the King’s School in Canterbury, dates back to Norman times. 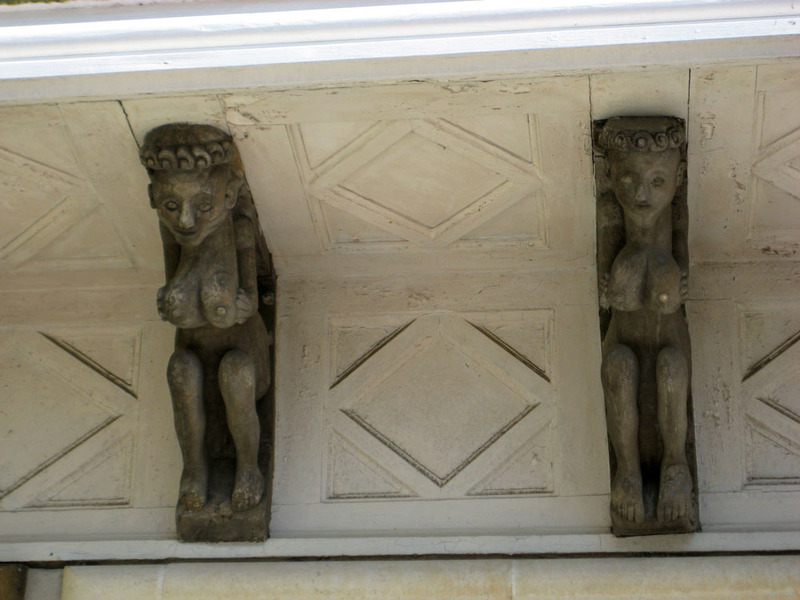 You can tell because of the distinctive geometric patterns in the archways. That means it’s been around since the late 1100s. 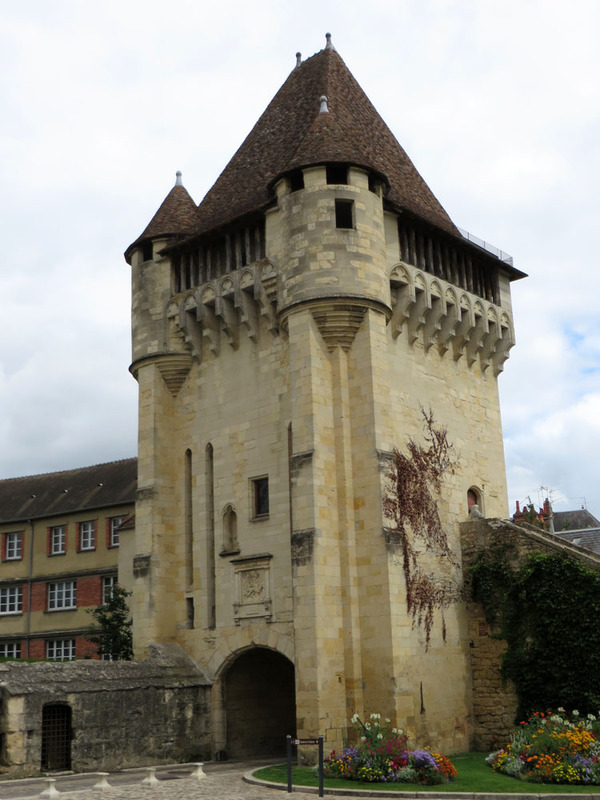 Part of the original wall and defences of Nevers, in France. 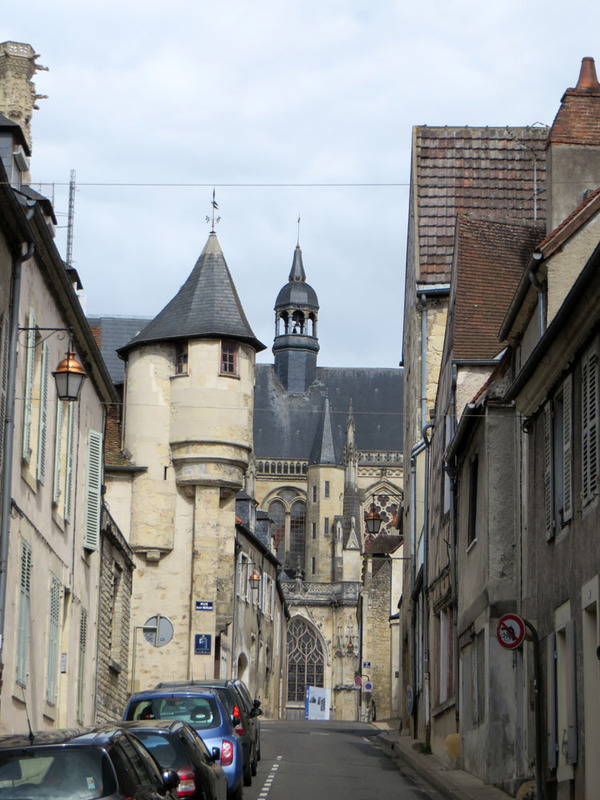 Still in Nevers, here is the cathedral as seen from one of the surrounding medieval streets, with their medieval buildings. 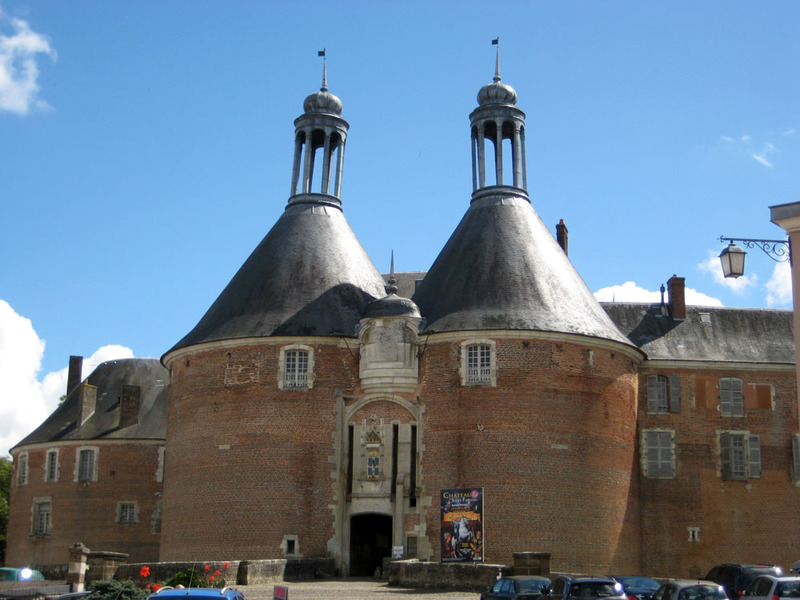 I find it fascinating that the ‘witch’s hat’ style of roofing was so prevalent in France, when you won’t find it in England even after the Norman conquest. 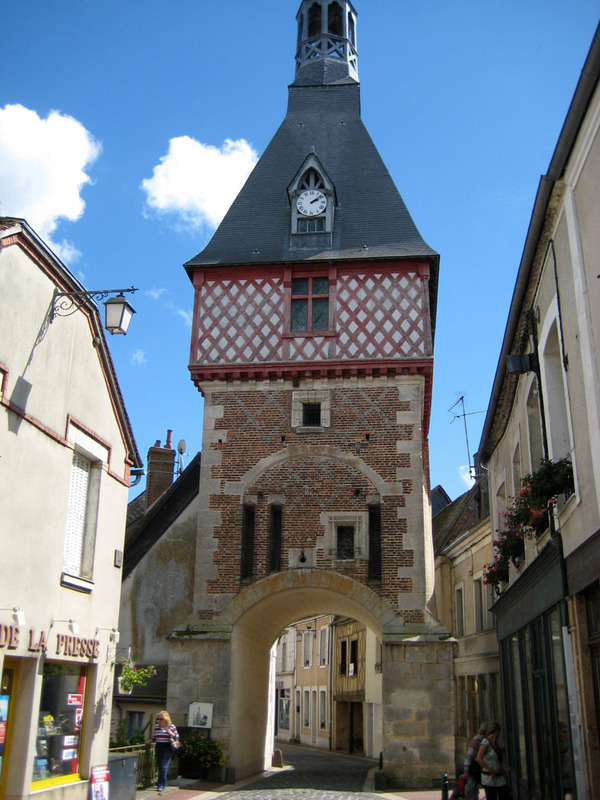 So, not very far from Guedelon is the small town of Saint Fargeau. 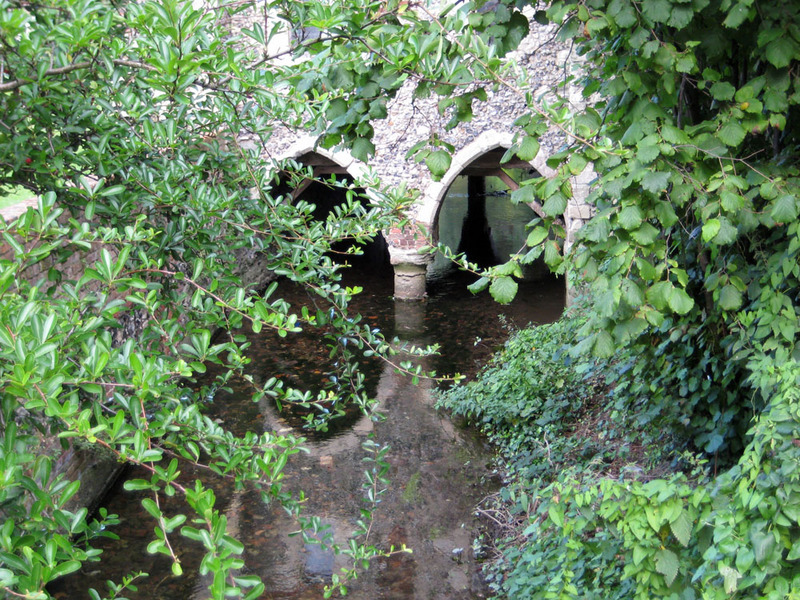 The top photo is one of the medieval gateways into the township. And the other two photos show its amazing chateau, or castle, which sits smack bang in the middle of the township. It was bought by a French family and they’re in the process of restoring it. These are the same people responsible for Guedelon. To get a sense of the castle’s full scale you can visit its web page here. 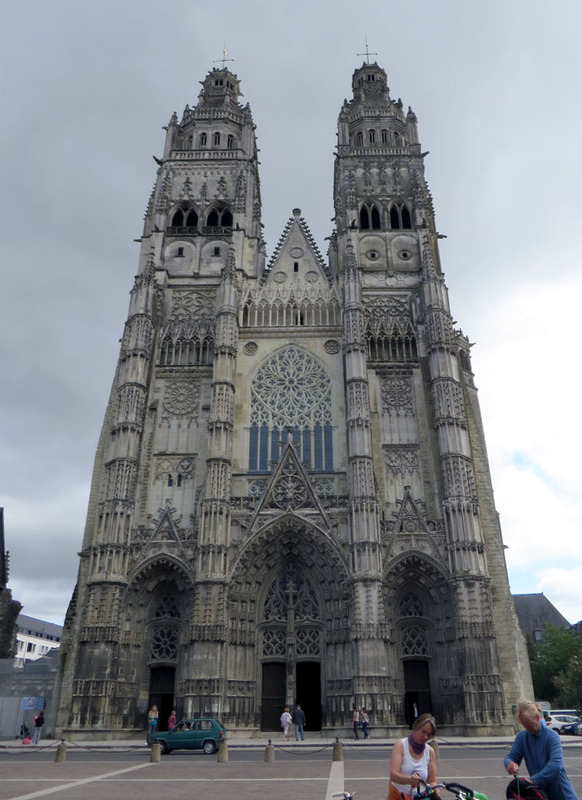 Absolutely amazing, and it will be fabulous once the restorations are complete. 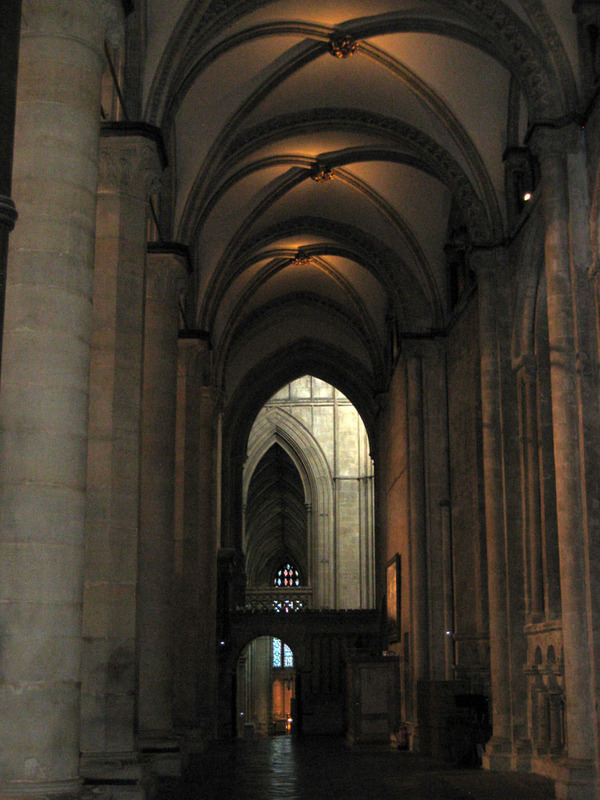 The moody beauty of Canterbury Cathedral. Remember I mentioned the four knights who murdered Thomas Becket, Archbishop of Canterbury? Well, this is the inn from whence they departed to commit their terrible crime. Which means this building has been around since before 1170. 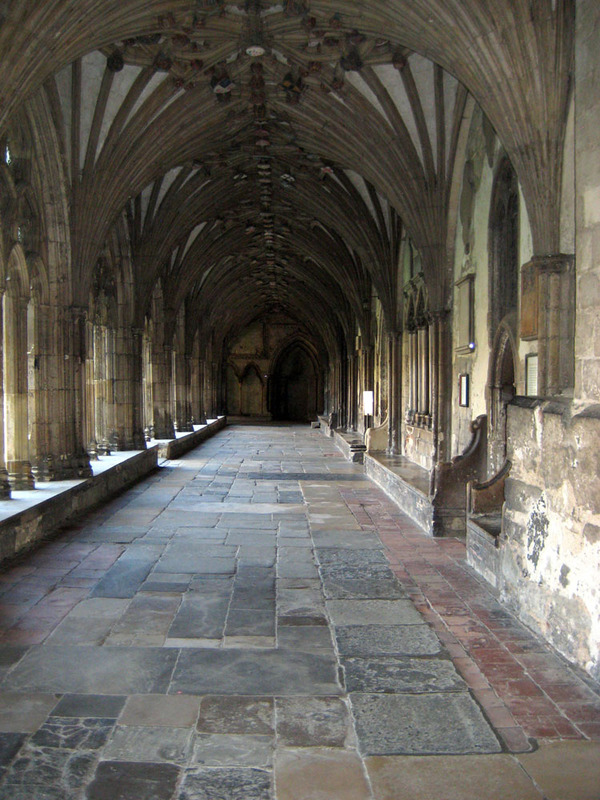 A cloister at the rear of Canterbury Cathedral. 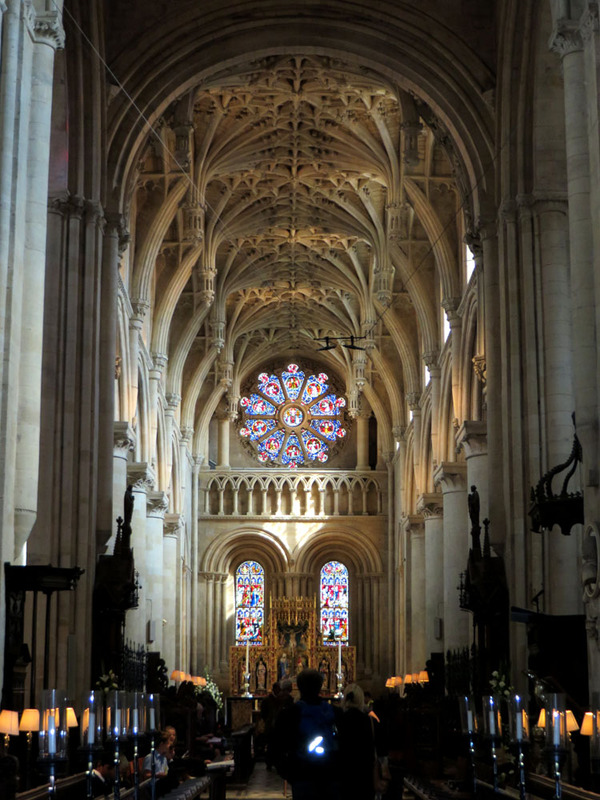 The original cathedral was established in 597, and completely rebuilt between 1070 and 1077. 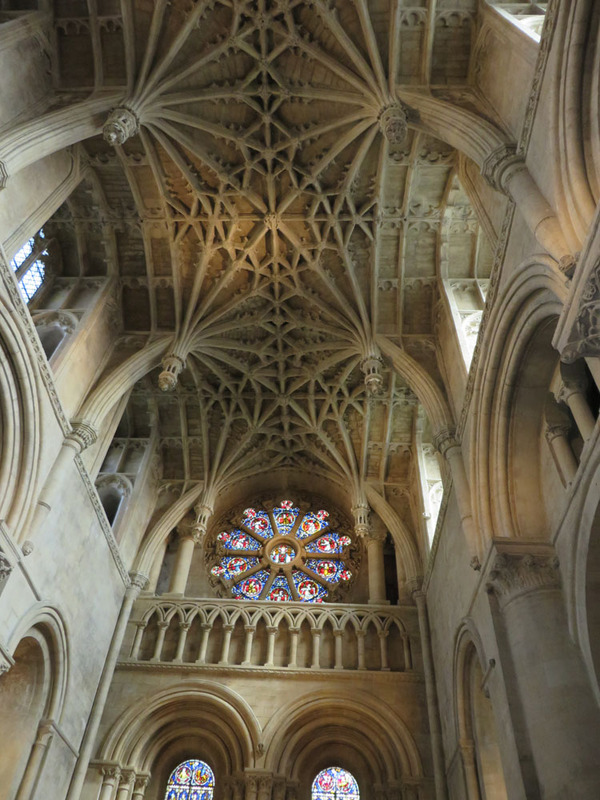 The ceiling of one of Christ College, Oxford’s, elaborate entrances. 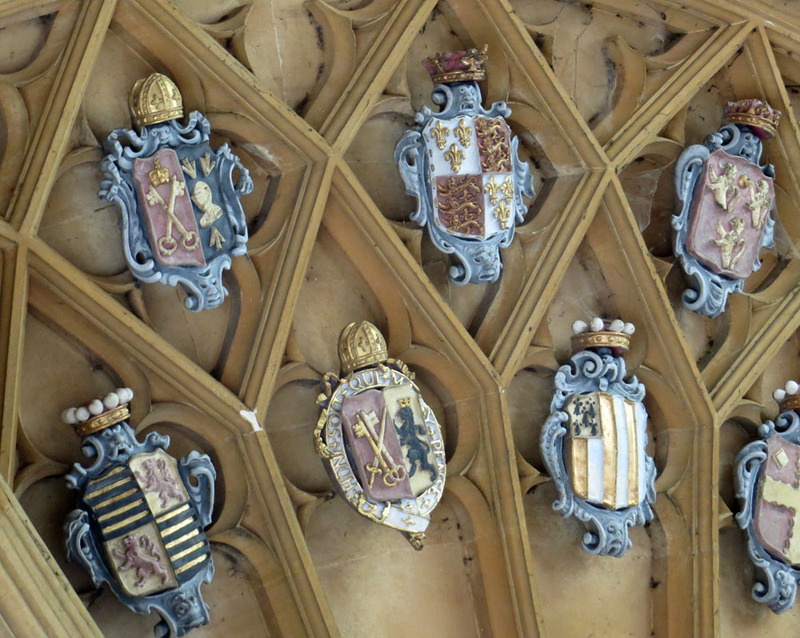 These are the coats of arms of families with attending sons, and college patrons. This entry was posted in Research and tagged photo essay by Karen Miller. Bookmark the permalink.